This is the third and final piece to the goal setting puzzle. If you haven't already, check out part one and two! To go along with this series, there is a free downloadable mini workbook for you to dive into. I want the mini workbook! Sign up with your email address to access your free pdf workbook. Thanks! Click here for your mini workbook! The last step of goal setting (before actually getting to the doing part) is setting weekly goals. Your weekly goals are behavior goals that keep you on track to hit your three month/short term goals. It's important that your weekly goals are very specific, so that at the end of each week (or even at the end of the day) you can very clearly determine if your goal was completed. Why are behavior goals so important?? Here's an example: instead of saying "I will bring my lunch to work"- which sounds like a pretty good goal, a behavior goal would be "I will pack a lunch form home 4 days per week that includes a protein and a fruit or vegetable"....see the difference? You know exactly what you need to do and when to do it in order to be successful. Example 1: If you are planning on running a race consider how far you currently run, and how many times you can realistically run (or walk or jog) each week. If you currently don't run at all, but in 3 months you plan on running a 5k, a good weekly goal for your first week could be, I will walk 30 minutes per day for three days this week- Monday, Wednesday, and Saturday. Then each week thereafter you could add more time, or introduce running intervals (walk 1 minute, jog one minute for 10 minutes each), etc. Another option would be starting with jogging 2 days per week if that's all you have time for, and then increasing it the next week. Example 2: If your three month goal is to have more energy and only need one cup of coffee each day, then you could work on a few different habits in the next three months. You could decide to focus on getting more sleep, on walking in the afternoon instead of having caffeine, drinking more water throughout the day, exercise, etc. If you decided to first address your sleep habits you could say I will be in bed by 10:30pm with the lights off 6 days per week. If you wanted to focus on water intake and you currently drink 32oz of water each day, you could say I will drink 48oz of water each day. 8 oz when I wake up and then 8oz with each meal and snack, and then one before bed. These are just a few examples. No matter what area of your life you are planning to focus on be sure your goal is specific! As always, if you feel like you need some additional coaching or accountability, I'd love to help. To set yourself up for success, I recommend you use a planner or calendar in combination with your goals. I love the google calendar app and I also use a paper calendar. Do what works for you and most importantly, be sure you look at it every single day! Looking at your goals daily and having reminders in place will keep you moving toward your three month goal, and of course the ultimate goal-your wellness vision. It's one thing to create a great goal, but scheduling it into your life is where the magic happens. By checking in with yourself weekly, you'll be able to easily track your progress and make tweaks, whereas with a longer goal like monthly for example, you might waste time doing something that doesn't work for you. You should never feel tied to one specific behavior if you just aren't feeling it. Always feel free to try new workouts or new ways of doing things to find the perfect system for your busy life. The reason I don't give a template meal or workout plan is because I don't know you. Only you know you. You know your habits, you know where you struggle, and what specifically you need to overcome. If you want more info on changing your mindset and overcoming negative thought processes that hold you back, you'll definitely want my workbook! There's a whole chapter on mindset, which is a crucial part of having success and meeting goals. Now that you know how to set weekly goals, feel free to download the pdf mini workbook and get to work! I'm excited for you to work toward your healthier lifestyle. 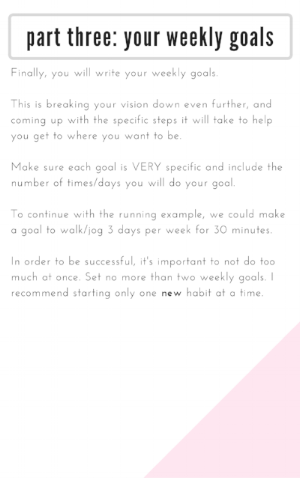 Here's a preview of the weekly goal worksheet! Sign up with your email address to free pdf download. Thank you! Here's your worksheet! Click here to download. If you feel like you could use even more help with setting your goals AND meeting them, check out my full length workbook here. It's 44 pages of awesome info to launch you into your healthy lifestyle without wasting any time. Did you join a gym this year? When you join the gym, take a tour! You'll feel more comfortable knowing where all the bathrooms, weight room, group fitness rooms, etc. are located. Most gyms offer a more specific intro session with a trainer to show you where all of the equipment is located and what it all does-take advantage of this! Go to group classes. If you aren't sure where to start or don't want to hit the weights just yet, try out different classes. I have a whole post here about why I think group fitness is great, but essentially you'll get a great workout, stay busy for 45 min to an hour, and you won't have to come up with your own workout for the day. Win-win-win. If you are ready to hit the weight room but feel intimidated-- go during less busy hours the first few times so you get comfortable and can locate everything without a bunch of people in the way. This time of year might be hard to find an empty gym at any time of the day, but usually early-mid afternoon or late night is great, or weekend evenings. I highly recommend the app Jefit which shows little animated picture of each exercise as well, so you can correct your form. I also recommend this as an intro program- it's free! Even better than starting on your own would be to hire a trainer for a few sessions. This will ensure your form is correct and teach you the basics. Don't give up! Everyone started as a beginner! Everyone at the gym is focused on their own workout, so go in there and get it done! You deserve to feel great. Most importantly... don't give up! Everyone was a beginner at some point.